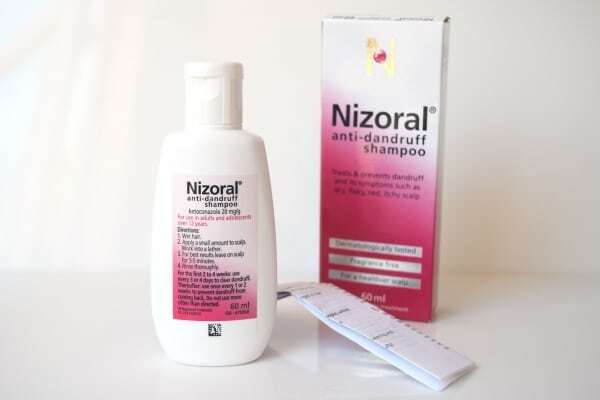 Nizoral is probably the most effective shampoo on the market to control dandruff caused by seb derm. It’s technically a medicine and is one of few anti-dandruff shampoos approved to make healthcare claims i.e. to treat and prevent dandruff. With a 2% dose of anti-fungal ketoconazole mixed into an 11 ingredient fragrance-free formula, if you suffer from moderate to severe seb derm – it’s a must try. Studies show significant and dramatic improvements in 30 days. Do you want an anti-dandruff shampoo proven to work? 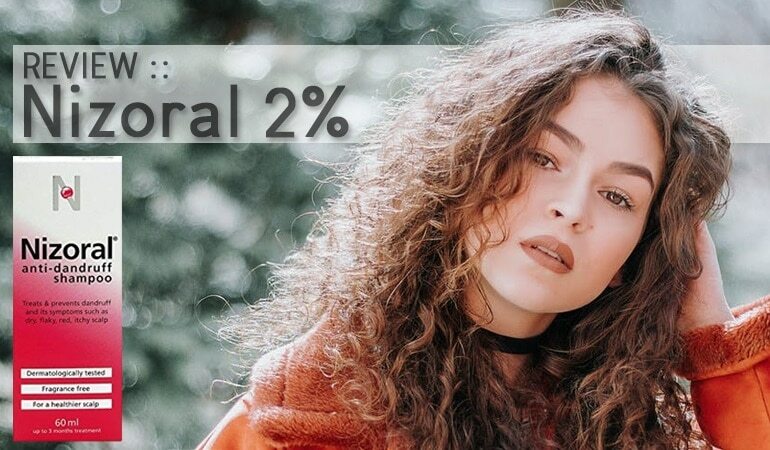 Nizoral 2% formulation is a stand out against most shampoos designed to treat dandruff caused by seborrheic dermatitis because it’s regulated as a medicine. And that’s the reason why it’s able to make on pack claims of ‘treats and prevents dandruff i.e. health claims. Nizoral anti-dandruff shampoo contains only one active ingredient – an anti-fungal called ketoconazole – a 2% concentration. Read our Nizoral review to find out. Before we delve into the formula it’s time to start at the beginning. Who makes Nizoral anti-dandruff shampoo and are they dandruff experts? Turn to the back label of your Nizoral anti-dandruff shampoo and right at the bottom, you’ll find the name of the company who make it – McNeil Products Ltd.
McNeil Products are an American founded company which began life as a drugstore. Fun fact – McNeil Laboratories invented what would go on to be known as the popular pain medication – Tylenol. In 1959 McNeil laboratories were sold to Johnson & Johnson remaining under J&J’s control until June 2018 when the brand was purchased by Strada – the makers of Hedrin – a popular head lice treatment. It’s clear Nizoral 2% formulation has been made, formulated and tested by highly reputable companies. Bottom line – we can trust them. Now, what about the product itself? How does it arrive? What should you expect? 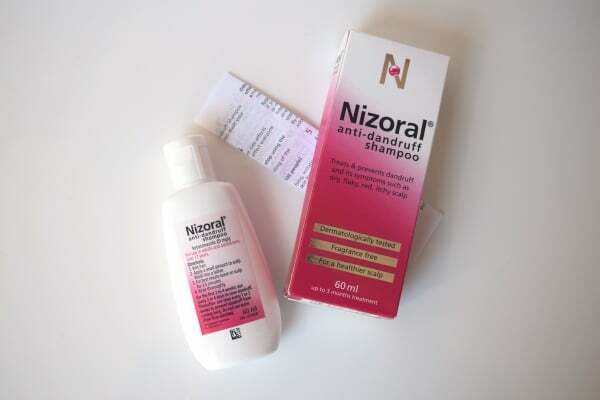 Nizoral anti-dandruff shampoo is sold in a 60ml/2oz bottle which the packaging states is enough for up to 3 months of treatment. You won’t miss Nizoral’s branding amongst other healthcare products – with distinctive/loud red and white branding the box and its inner plastic bottle are memorable. On pack claims draw us in to learn – Nizoral anti-dandruff shampoo is dermatologically tested, fragrance-free while also claiming to result in a healthier scalp. Next stop – in use performance. We know Nizoral anti-dandruff shampoo is a healthcare product – can it match up to the In use performance of a normal shampoo? 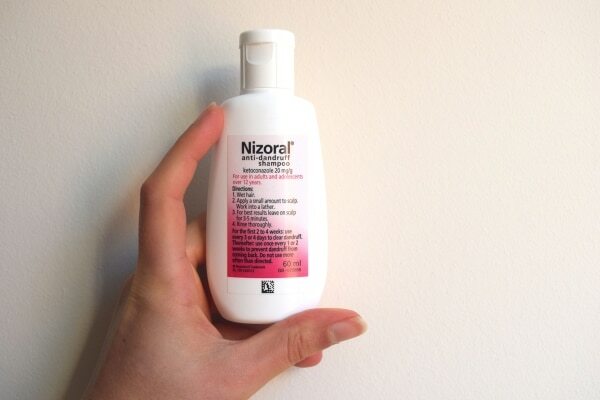 Nizoral’s plastic flip top cap is easy to open and on a firm squeeze surely allows the required dose of surprisingly pink Nizoral anti-dandruff shampoo liquid. Its scent free as promised and lathers moderately. What you’re likely to notice when using Nizoral anti-dandruff shampoo is a slightly squeaky feeling of hair. This is telling that the cleansing ingredients in Nizoral anti-dandruff shampoo are strong i.e. they’re removing excess but also protective grease and sebum from hair and scalp. The longer you leave Nizoral anti-dandruff shampoo on for, the greater this effect. Long hair types will very likely need to follow with a nourishing conditioner. Other than this need to know you’re unlikely to notice any differences between Nizoral and other popular mainstream shampoos. On to the most important part. What makes Nizoral anti-dandruff shampoo able to treat dandruff? Is the active ingredient widely accepted to work? Nizoral anti-dandruff shampoo is active because of an anti-fungal ingredient known as ketoconazole. Nizoral, in this instance, uses a 2% concentration of ketoconazole. In the EU and Canada, this concentration is available OTC but in the USA you may need a prescription. In the US, another formulation called Nizoral AD is available OTC, but this is only a 1% formulation. A 1% concentration is clinically proven to not be as effective as 2%. Fact: Ketoconazole was first used to treat dandruff in tablet form as an oral medicine. Using this anti-fungal active topically i.e. at the site of dandruff enables best results with significantly fewer side effects. The shampoo contains ketoconazole, which is an antifungal that targets an increased number of yeasts on the skin called Malassezia. These yeasts occur naturally on everyone’s skin, however, people with dandruff seem to have more Malassezia. The shampoo also treats the inflammation associated with dandruff, relieving scalp redness and itching. This is what Nizoral tell us, but what about independently published studies? Is ketoconazole effective in the treatment of dandruff? A very recently published 2018 study showed a 2% ketoconazole shampoo to dramatically improve symptoms of dandruff over 30 days of use – when used once every 3 or 4 days. An older study completed in 1995 also concluded a 2% ketoconazole shampoo as highly effective to clear scalp seb derm plus help prevent relapse when used preventatively once per week. Another study concluded that ketoconazole is as effective as selenium sulfide in the treatment of dandruff. However, ketoconazole is a better-tolerated ingredient. A 2% ketoconazole is significantly more effective in the treatment of dandruff than 1% ketoconazole shampoo. Bottom line: Ketoconazole is found to be very effective in the treatment of dandruff and especially helpful for sufferers of severe seb derm – not many anti-dandruff shampoos are. Final stop – are there any other ingredients which can help Nizoral live up to its claim of treating inflammation i.e. scalp redness and itching? In an overall formula of 11 ingredients, Nizoral anti-dandruff shampoo has minimal space for skin soothing helpers. 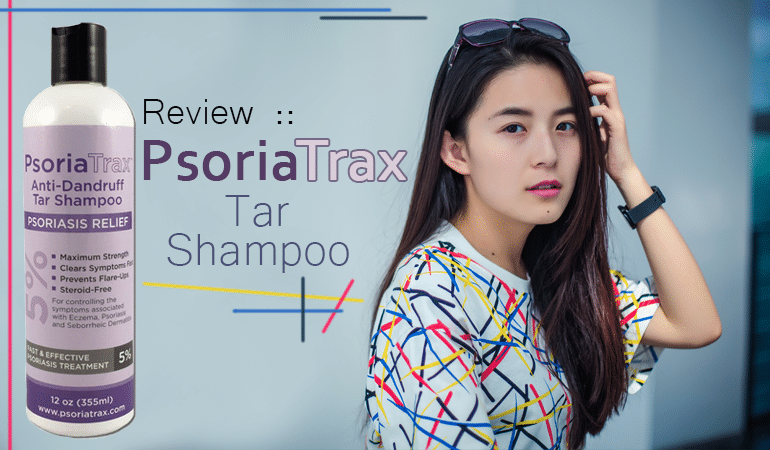 Some independently reported studies conclude Nizoral, in comparison to other shampoos containing actives like salicylic acid, may not significantly help relieve itching. Scanning the Nizoral ingredients list for signs of ingredients which may further aggravate your dandruff or seb derm, there are few. 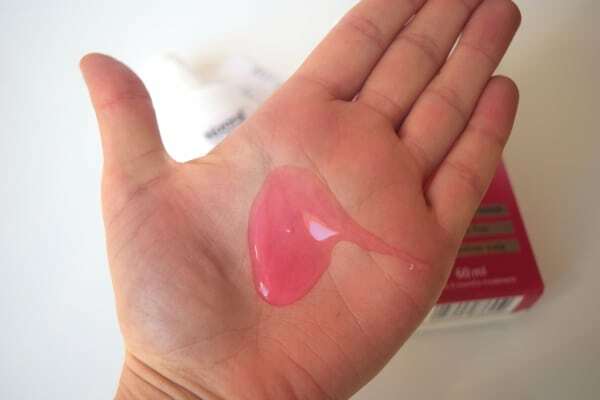 Imidazolidinyl Urea – found on the ingredients list as Imidurea – a formaldehyde-releasing preservative that in around 1 to 2% of people with contact dermatitis which may cause a flare-up. 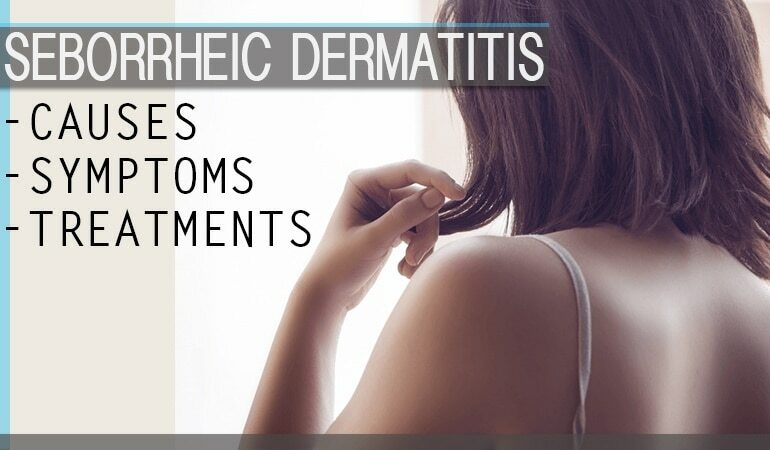 Other studies show around 0.99% with contact dermatitis react to Imidazolidinyl urea. Overall though, if you suffer from moderate to severe seb derm, a 2% dose of ketoconazole is as good as it gets to help combat your symptoms. The medical evidence is there, and anecdotally, this (and a 2.5% Selenium Sulfide shampoo) are still my go-to shampoos if I suffer from an outbreak. And they have been for many years. Hi there, great website! Which of these 2% keto shampoos is less harsh? sodium laureth sulfate paste, disodium laureth sulfosuccinate, sodium chloride, citric acid monohydrate, benzyl alcohol, tetrasodium edta, quaternium –15, poly quaternium – 7, dexpanthenol, laureth – 2, sodium hydroxide, perfume, purified water, erythrosine (E127). I’m not sure why its prescription only in the US when its available otc in Europe. It makes no sense at all. You can find it on ebay and the likes though. Couldn’t agree more. I still do use it if I have a bad breakout though. That or the Selsun 2.5 are my go to shampoos in a time of panic. I actually have to mix this with a gentler shampoo to use it fairly regularly, although I guess that brings it down to 1% so maybe not as effective? If it works for you then it’s just as effective!